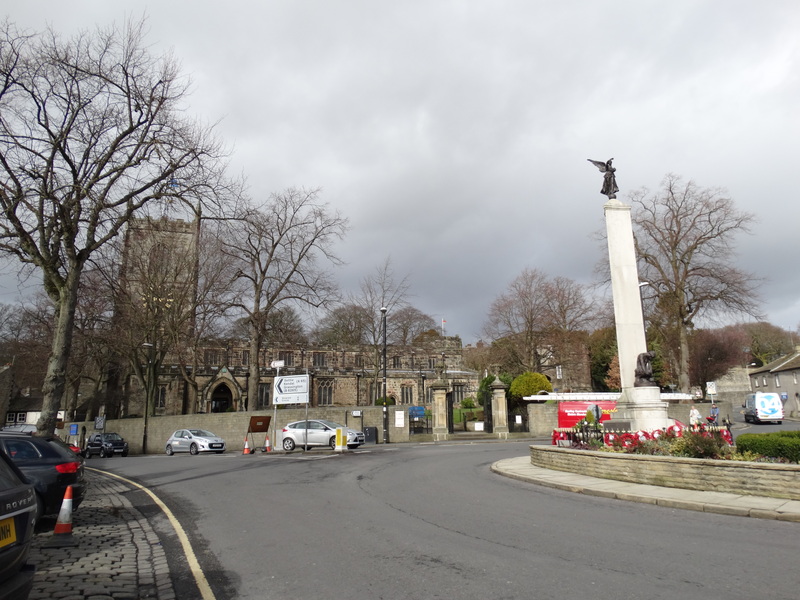 A day trip to this rather nice market town. The church at the top of the town is Holy Trinity. 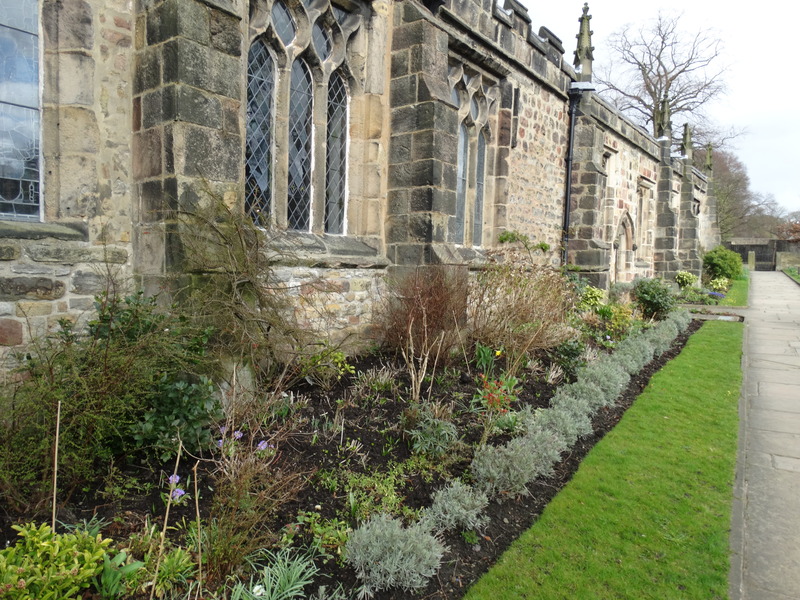 Wheelchair access is at the east side of the churchyard (though it isn’t signposted by the main, stepped entrance), but entrance to the church is flat. Lovely gardens beside the walls and a welcoming entrance. There is a wheelchair lift up to the café, but they weren’t sure how to operate it. We were asked very nicely if I minded pushing out, round past the tower and in to the café through the side door. No worries, but I deserved my soup when I got there. Very nice soup it was too. The first church here dates to the beginning of the 12th century, and another was built in the 1300s – the western end of the church dates to this time. 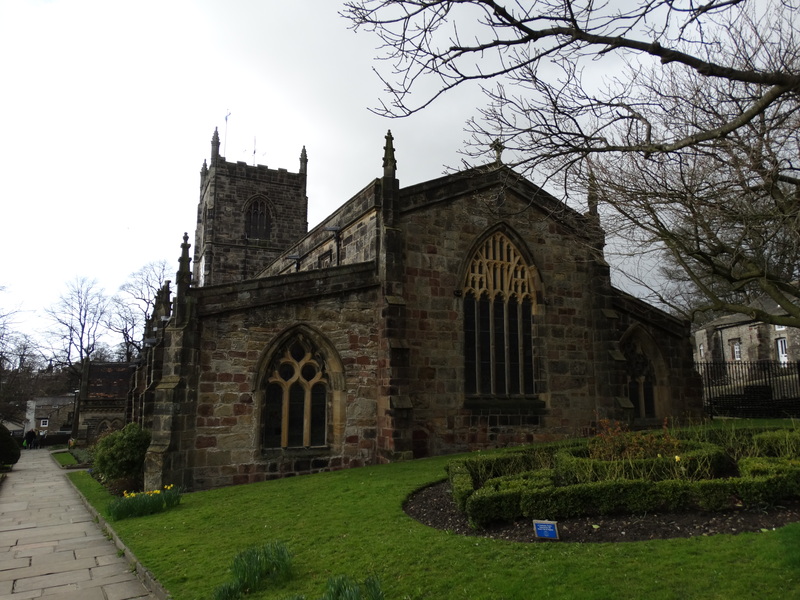 The church was extended eastwards at the end of the 15th century – King Richard III gave them £20 in 1483. 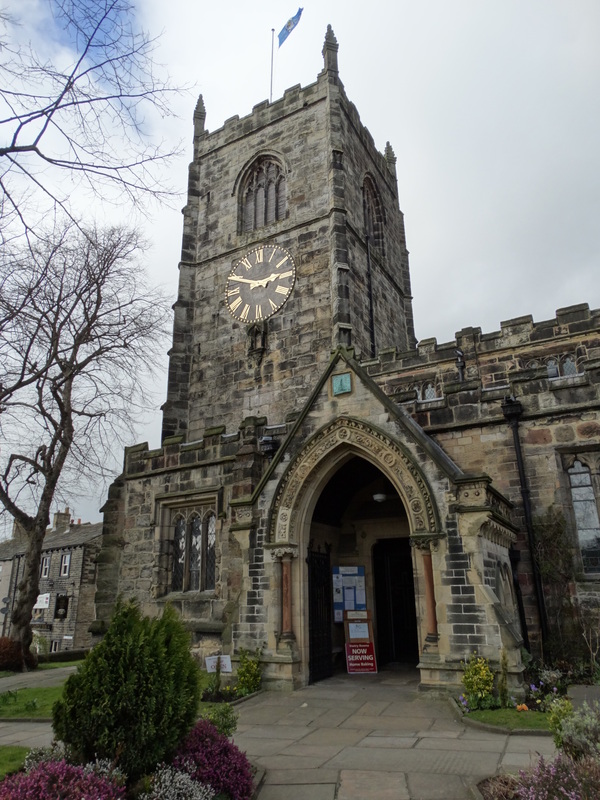 During the Civil War bombardment of Skipton in 1645 stray cannon shot damaged the church tower (says the Guidebook – imagine the insurance claim). The bells were also stolen. 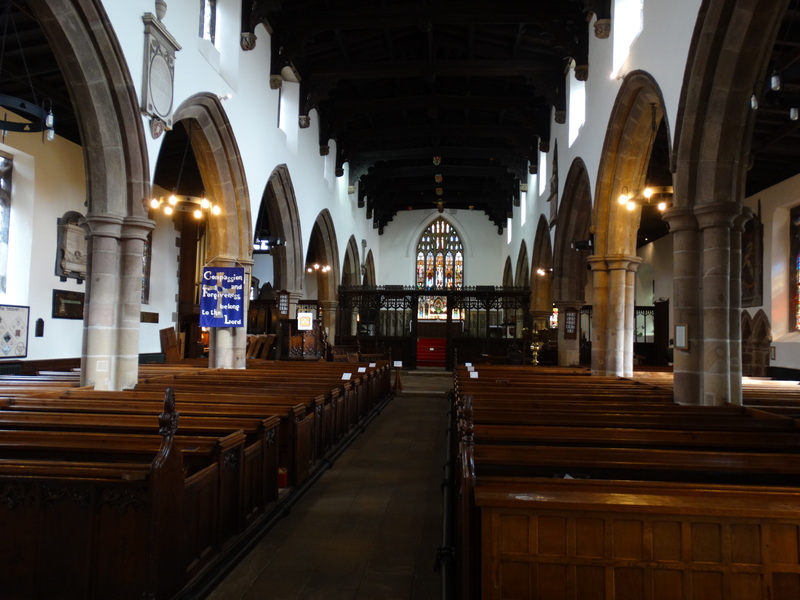 The present pews replaced the box pews in 1719. During a service on 19 June 1853 the tower was struck by lightning, which led to more repairs. The south porch dates to 1866, and there was another restoration in 1899. 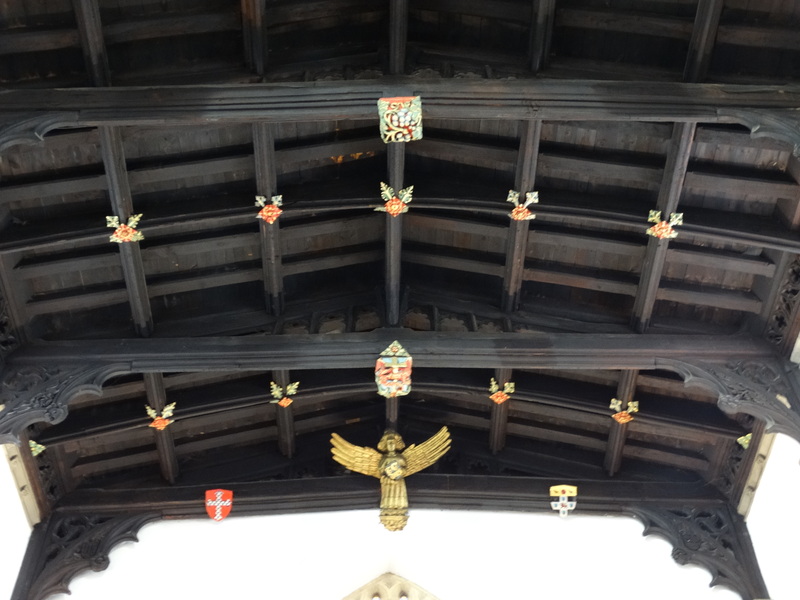 On 8 April 1925 the roof was struck by lightning – is God trying to tell them something? 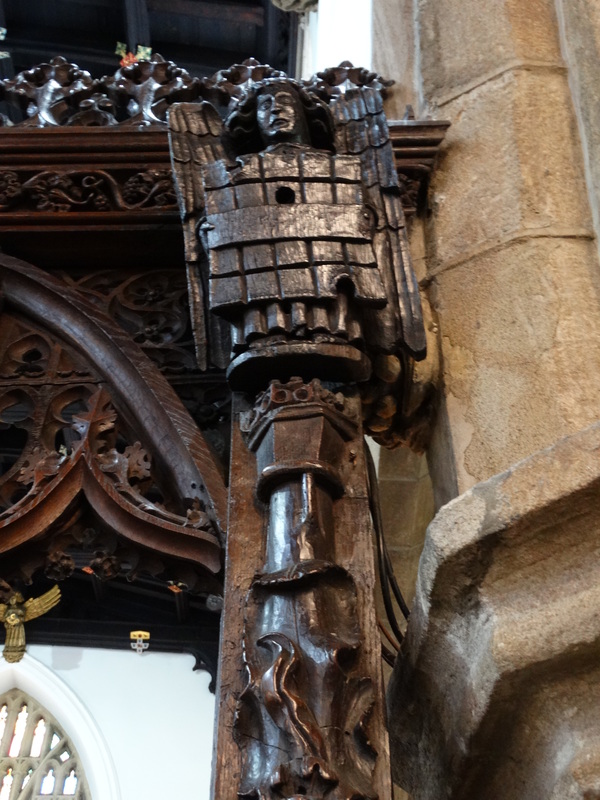 On this occasion the organ was destroyed in the subsequent fire – perhaps God was trying to tell the organist something! 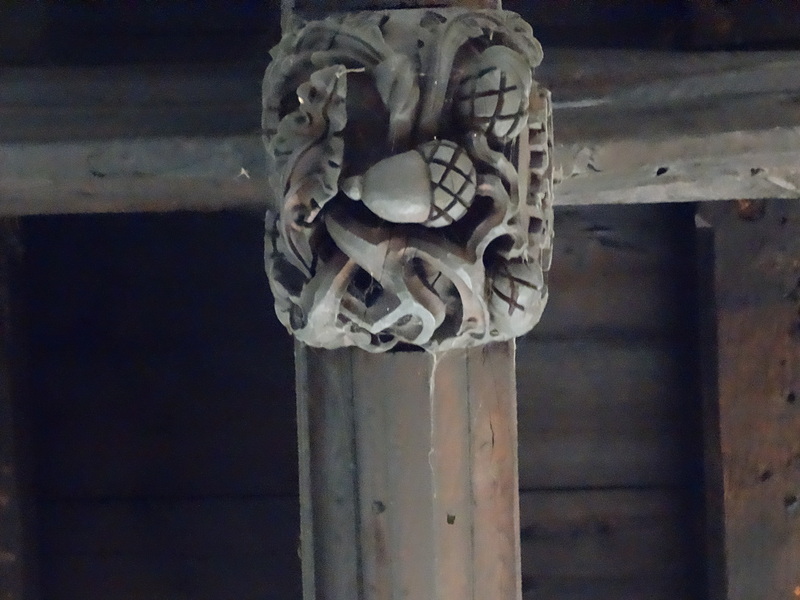 Let us look up first – some gorgeous C15 roof bosses (not brilliant photos, but I have a good zoom). 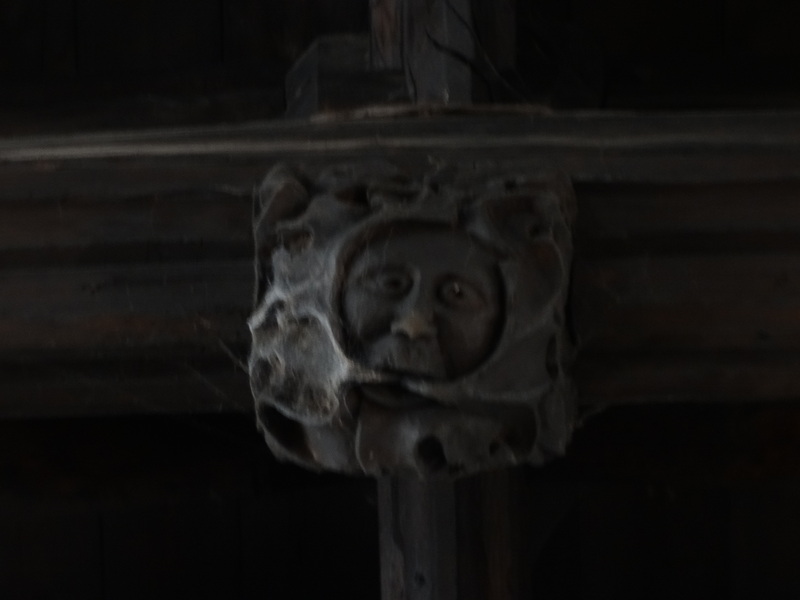 A Green Man and acorn are just two of them in the Nave, and the angel and painted work are in the Chancel. 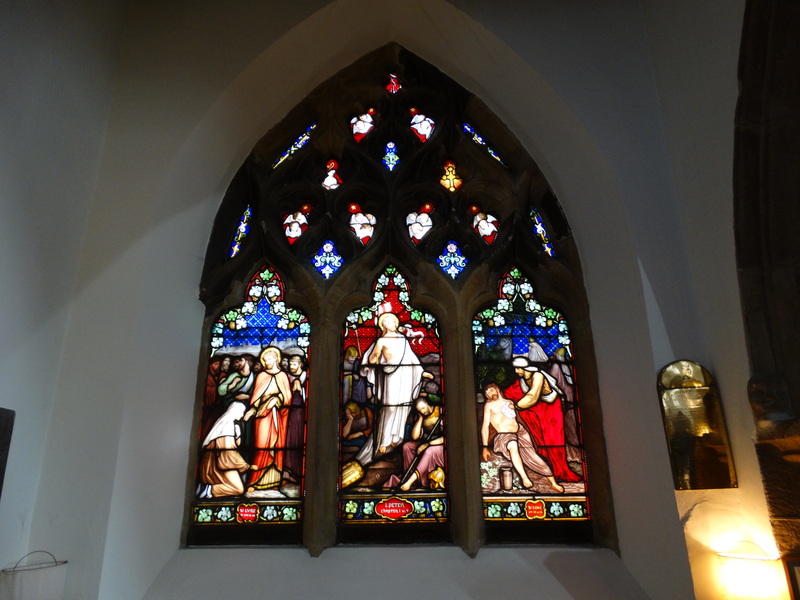 There is a nice selection of stained glass. 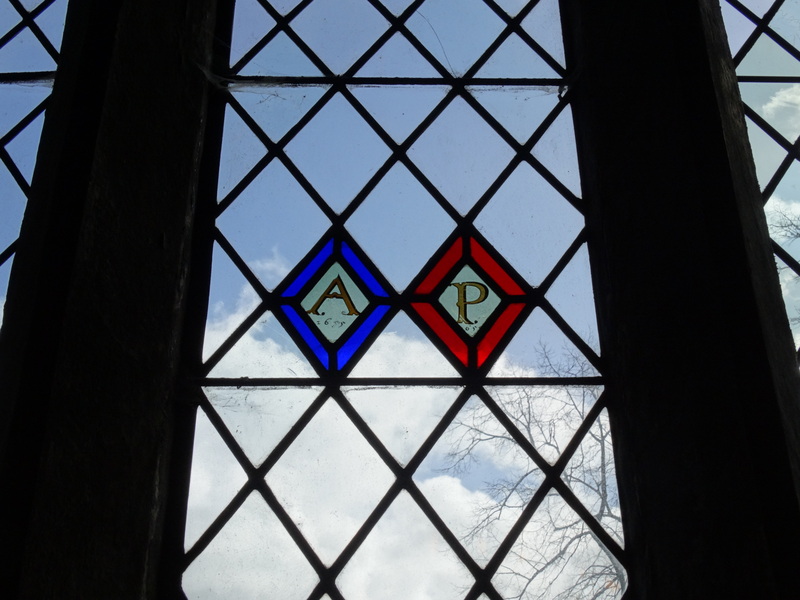 Lady Anne Clifford, Countess of Pembroke, repaired many of them in 1655, and added these initials. 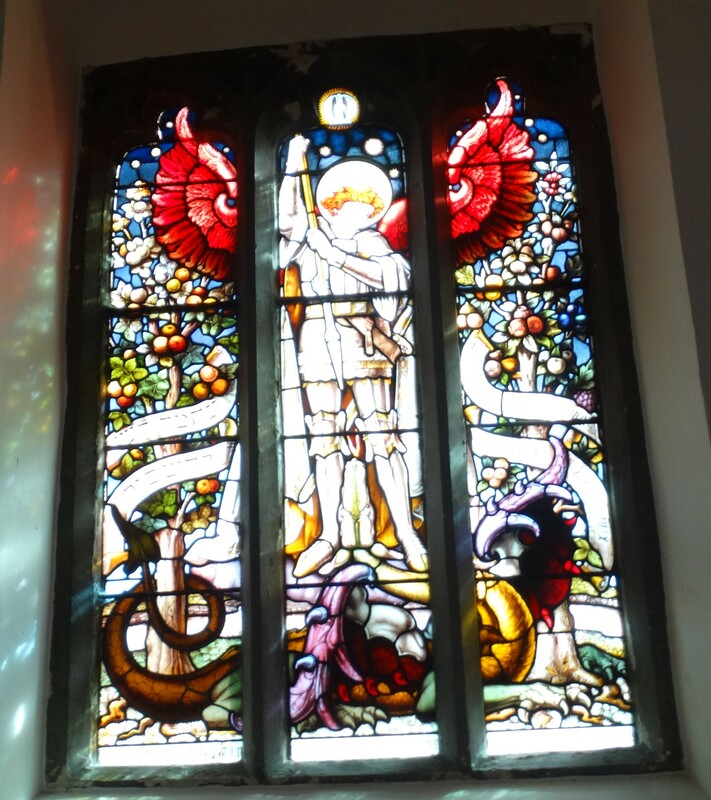 I think the next photo is off the west window by Shrigley and Hunt of Lancaster, a memorial to those who died in WW1. I liked this St George. 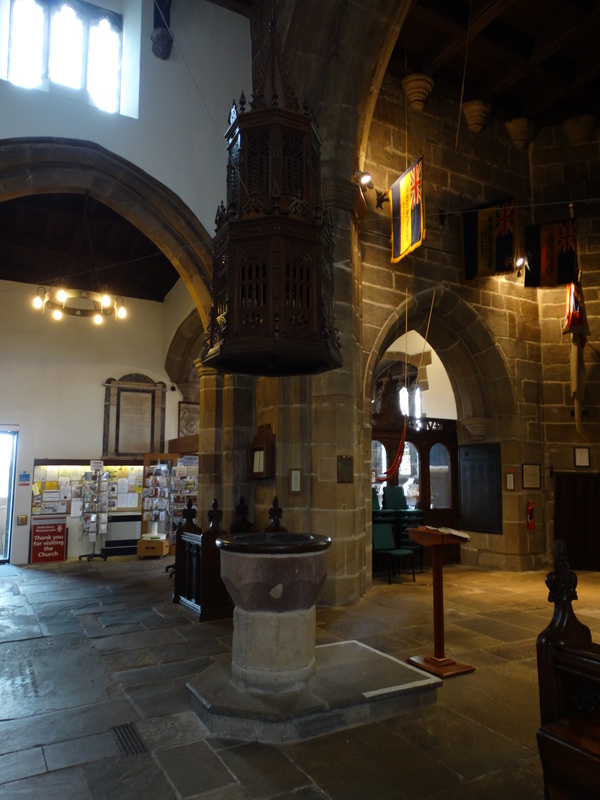 The area at the west end has a shop, children’s area, and the font dates to about 1300. 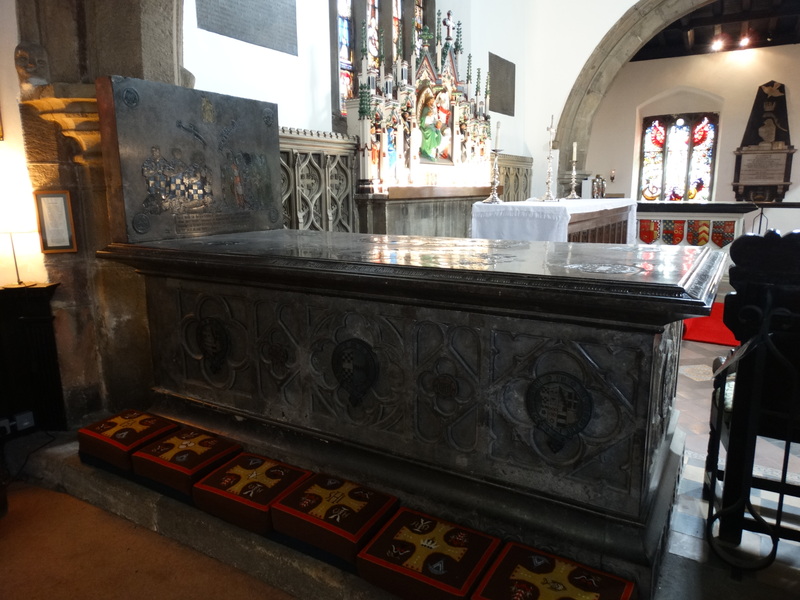 The font cover is Jacobean. 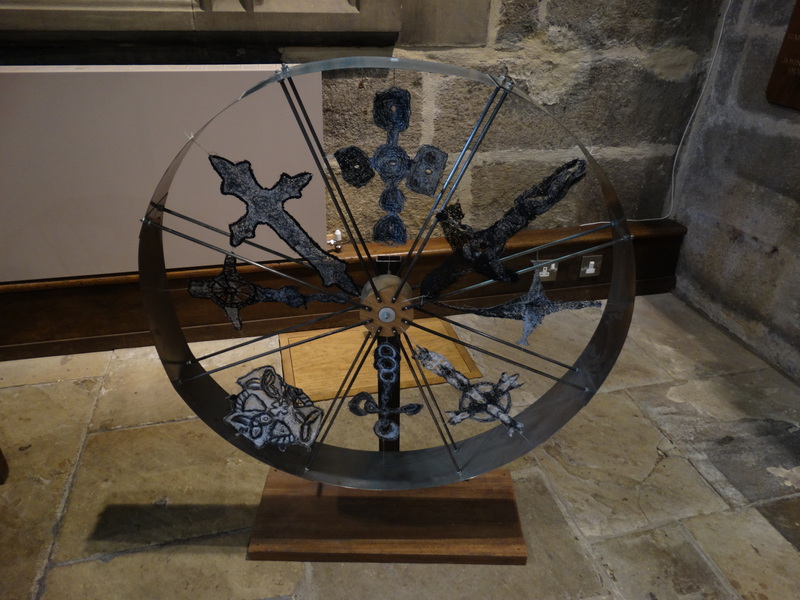 The wheel has been made by Craven College as part of an embroidery and art project. I didn’t take a close up photo of the whole Choir Screen. 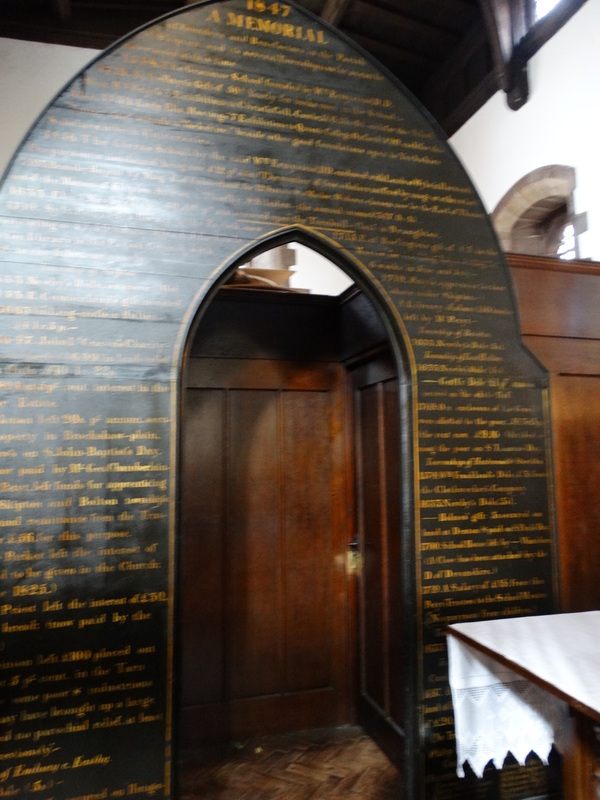 It used to carry a Latin inscription “In the year of Our Lord 1533, and in the 25th year of King Henry VIII”, and has some lovely carvings. The door with the Dole or Charity Board is interesting too. 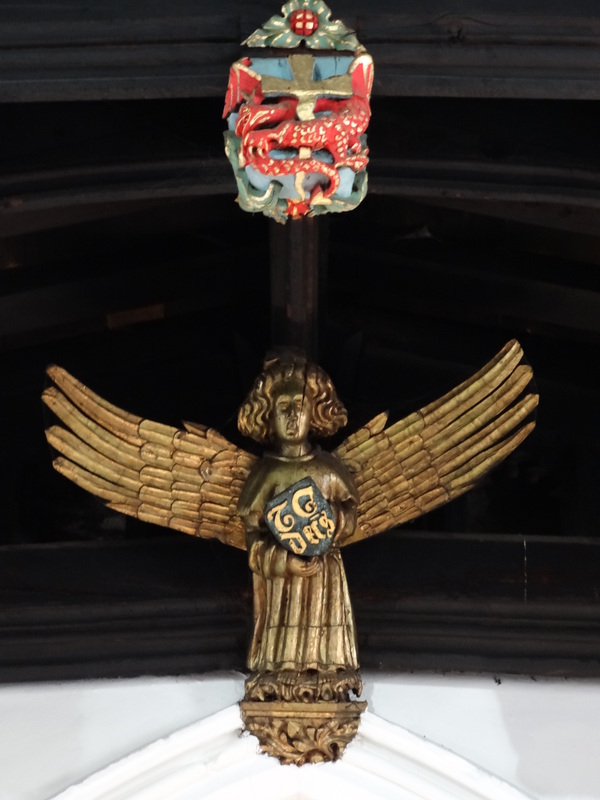 The Sedilia dates from about 1300 – the seats for celebrant, deacon and sub-deacon (the fourth was originally a piscina) and the Royal coat of arms dates from King George III in 1798. 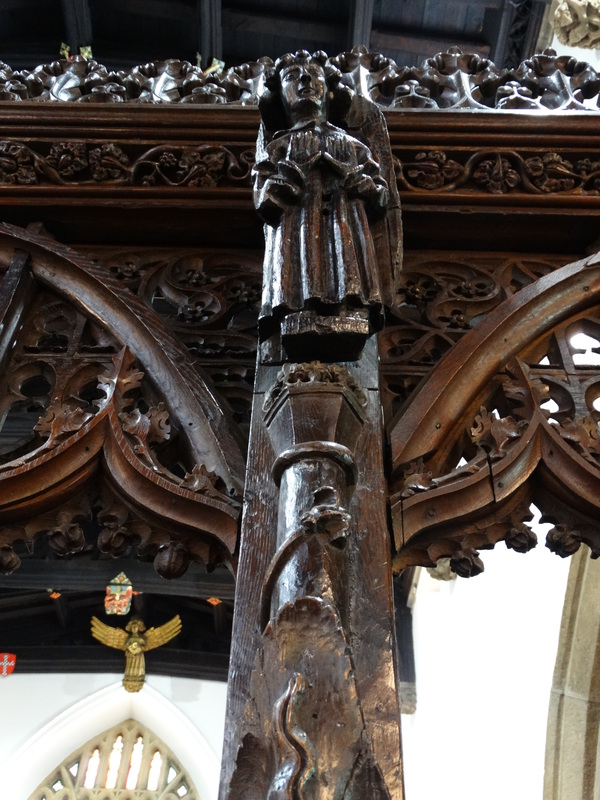 The carved oak High Altar supports a medieval altar slab and the reredos was constructed in 1870 to a design by Sir George Gilbert Scott. 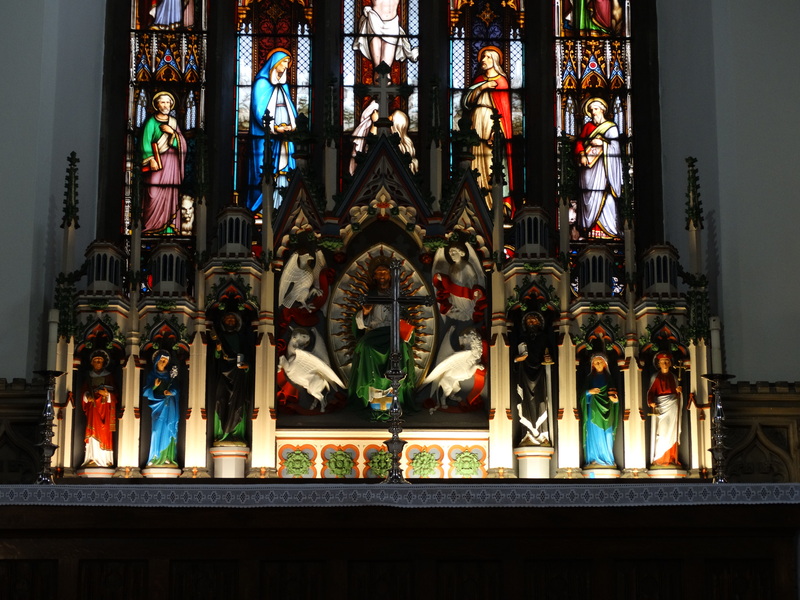 It was built of Caen stone, and portrays Christ in Majesty surrounded by symbols of the four Evangelists. Up by the altar are the wonderful Clifford Tombs. 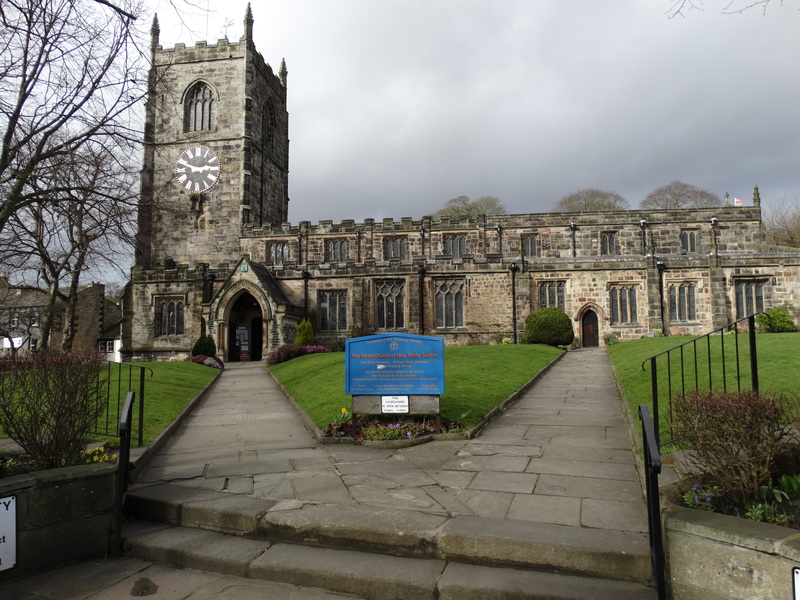 This church became the principal burial place of the Cliffords after the dissolution of Bolton Priory in 1539. 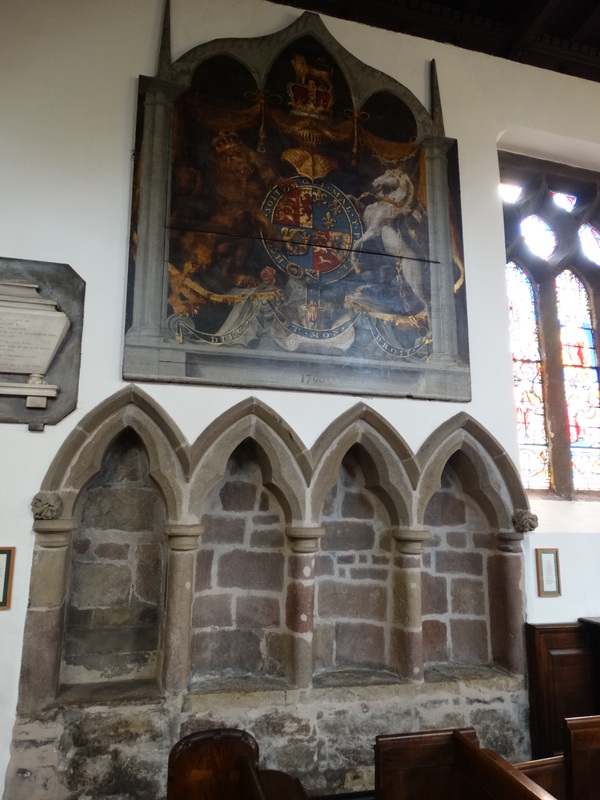 The vault under the sanctuary was built in 1542 after the death of Henry, 1st Earl of Cumberland, and this is his stone. 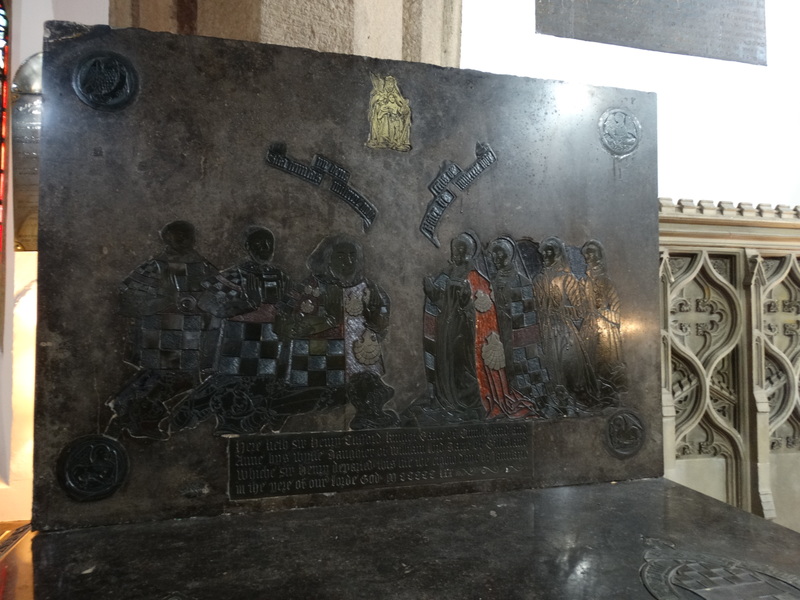 On the slab are figures in brass of the Earl and his wife, at the east end are brasses showing the family of Henry, 2nd Earl of Cumberland, at prayer, a figure of the Trinity, and the emblems of the four Evangelists. Of your charite pray for the soule of Sir Henry Clifford knight of the most noble order of the Garter Earle of Cumberland sumtyme Governor of the town and castle of Carlisle and President of the King’s Council in the North also of Margaret hys wife daughter of Sir Henry Percy knight Erle of Northumberland whyche Sir Henry departed thys lyfe the xxii daye of April in the yere of our Lord God MDCCCXLII on whose soules Jesu have mercy Amen. 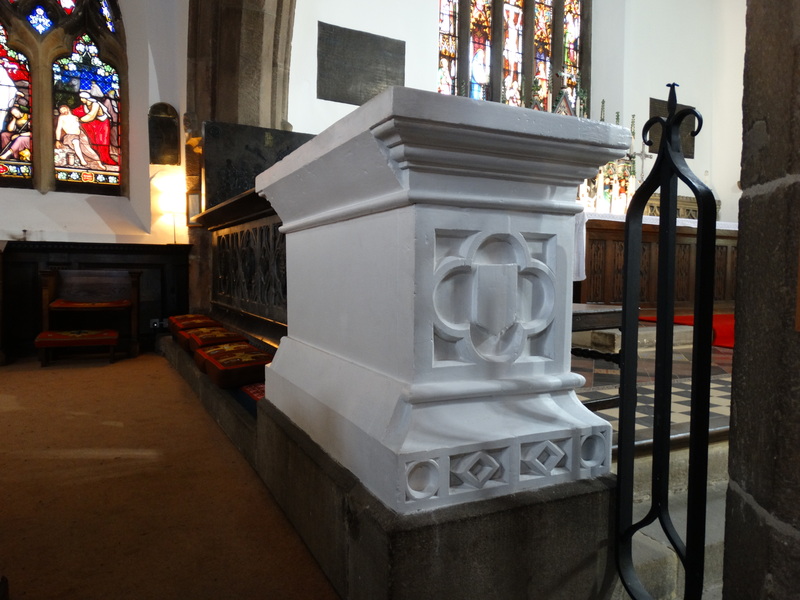 Next to it is this small tomb, the tomb of the infant Francis Lord Cumberland. He died on 11 December 1589, at the age of 5 years and 8 months. 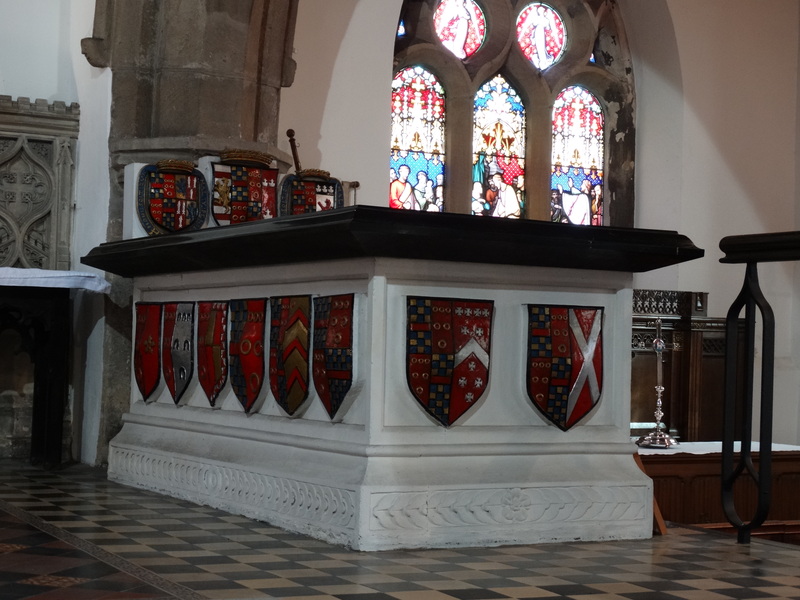 This beautiful tomb is that of George 3rd Earl of Cumberland. 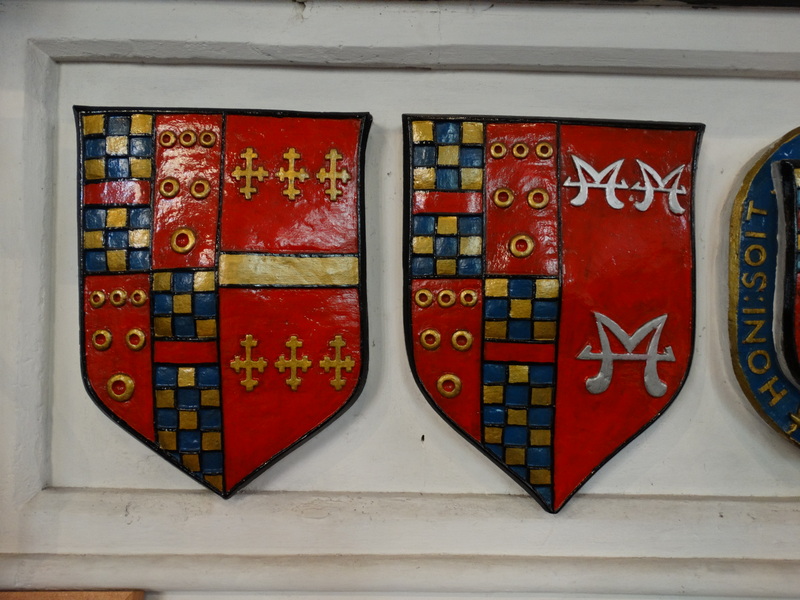 The seventeen coloured armorial bearings or shields illustrate his ancestry in heraldic terms. 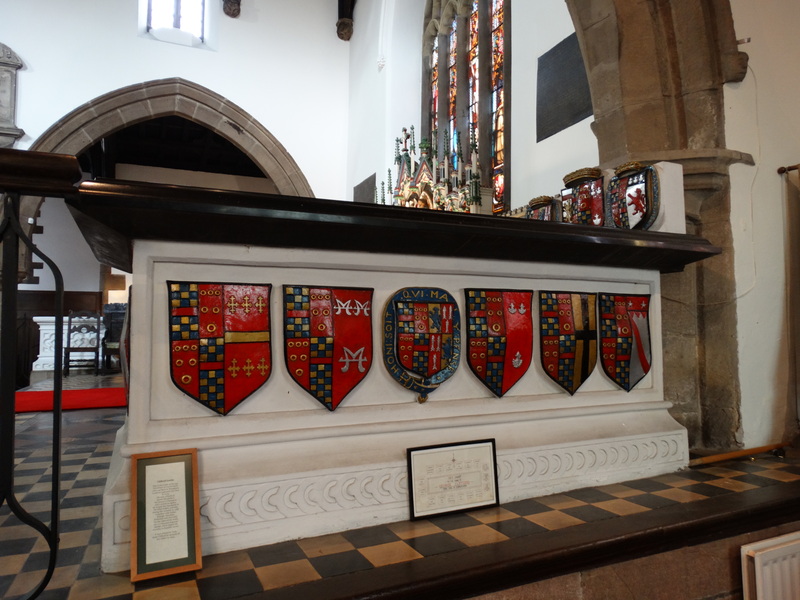 (Don’t suppose my tomb will ever have a series of armorial bearings illustrating my ancestry!). 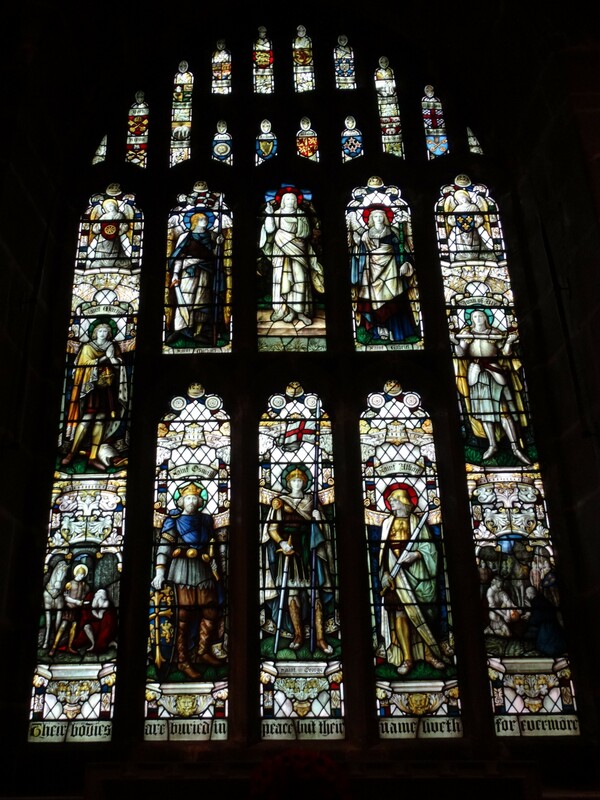 He was born in Brougham Castle in 1558 and died in 1605. He was a friend of Queen Elizabeth I, the Queen’s Champion and a noted navigator. He fought the Spaniards in the West Indies and also during the Armada. 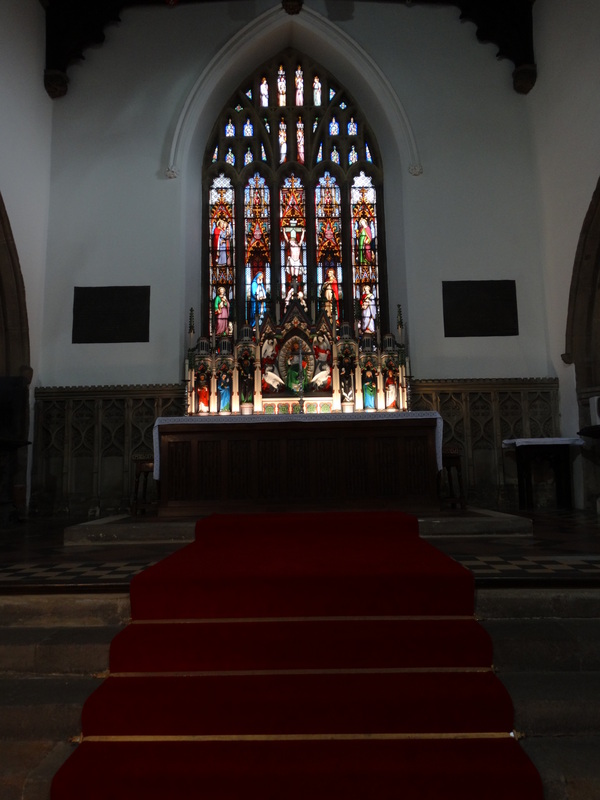 It was erected by Lady Anne Clifford in memory of her father in 1654. The tombs were restored in 1867 and again in 1989. 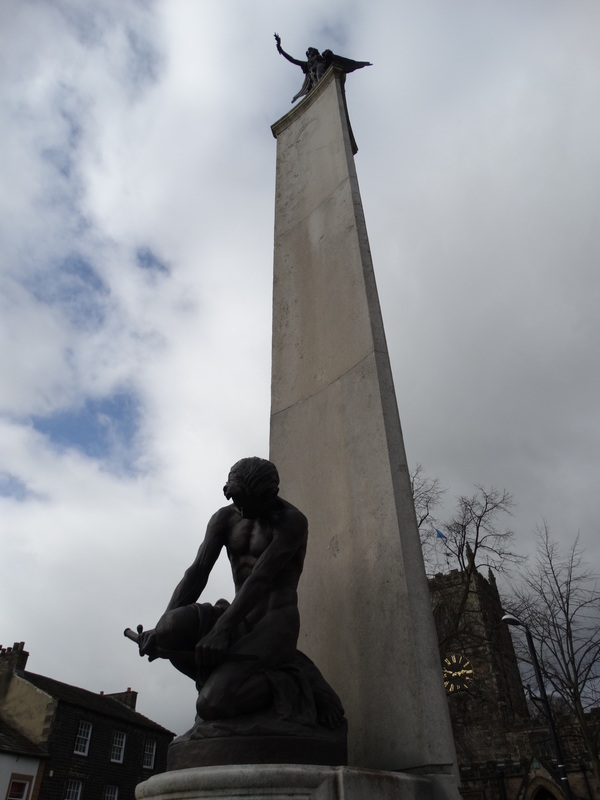 The War Memorial outside was designed by John Cassidy, a Manchester sculptor. It was installed in 1922. There is a good website. Nice friendly welcome, lovely church, and a nice town.